Eyes tell us so much about someone’s mood, confidence, and age. If your eyes look youthful, people notice. So how do you keep this feature fresh? We’ve got you covered with our 5-step approach. 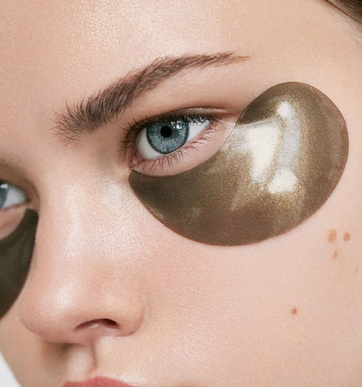 Reboot—The skin surrounding your eyes is delicate. As we age, collagen in this area breaks down fastest, leading to lines, crepey texture, and dark circles before other areas of the face. It’s therefore important to optimize your habits to keep eyelid skin healthy. “Always wash with a gentle cleanser and avoid excess rubbing that can lead to dark discoloration,” says Dr. Jennifer Herrmann. “Make-up can hold environmental pollutants and toxins, so it’s important to take off makeup every night before hitting your pillow.” And if you’re prone to puffiness, “getting enough sleep, minimizing salty foods, and reducing stress are helpful. Stress causes an increase in the hormone called cortisol, which damages collagen, making the skin stiff and less supple,” continues Dr. Herrmann. Although genetics play a role in eyelid skin aging, by treating the skin in this area gently, by eating a healthy low-salt diet, and by minimizing stress as best as possible, you’ll have a leg up on the aging process. Smooth—Years of squinting and smiling eventually lead to fine lines that radiate from the eyes (yep, crow’s feet). As lines start appearing, using a muscle relaxant like Botox or Dysport can smooth the area. “Dysport disrupts the signal between the nerve and squint muscles, so that the muscles can’t contract,” says Dr. Lisa Chipps. “This smoothes the skin, giving the eyes a younger, more refreshed appearance.” Botox or dysport treatments are virtually painless and can be repeated every 3-4 months for maintaining line-free skin. Tighten—As eyelid skin continues to thin with age, we eventually start to notice texture problems. The eyelid becomes loose and crepey like a raisin. “Because decreased collagen and elastin are the problem, we tackle texture problems with treatments that build collagen,” says Dr. Eddie Fincher.” Minimally invasive microneedling radiofrequency treatments or fractionated CO2 laser resurfacing create microscopic skin wounds with heat to stimulate a wound healing response that generates collagen production,” adds Dr. Fincher. These tightening procedures often give patients at least 5 years back in time. Correct—If the upper eyelid skin is too heavy, or if under eye bags are significant, the next step is to consider minimally invasive surgery. “An upper lid blepharoplasty can beautifully open the eyes, while a lower lid blepharoplasty can minimize eye bags by removing and repositioning excess under eye fat,” says Dr. Ronald Moy. “Through newer more innovative approaches, we’re able to do these procedures while patients are comfortable but awake, which makes the recovery process much easier.” And to minimize scars and provide simultaneous skin tightening, CO2 laser resurfacing can be done at the time of blepharoplasty surgery, giving superior results. Maintain—Maintenance with all of our procedures is key, reminds Dr. Herrmann. “It’s like cross training for the skin. We encourage patients to continue with excellent skincare and clean make-up after eye rejuvenating procedures, so that results last longer.” Broad-spectrum sunscreens and make-up free of irritating or allergenic chemicals should be used after procedures to prolong results. In addition, the physicians recommend using a growth factor serum like DNA EGF Regeneration Serum. Growth factors are normally found in the skin and help repair damage, support collagen and elastin synthesis, and assist in maintaining the skin’s protective functions. But as we age, they decrease in number and ultimately they can’t keep up with the aging process. By adding these important factors back into the skin, we can keep skin looking younger longer and better maintain procedure results. To learn more about how you can restore more rested, younger looking eyes, call us to book a personalized consultation with one of our board certified, fellowship trained dermatologic surgeons.